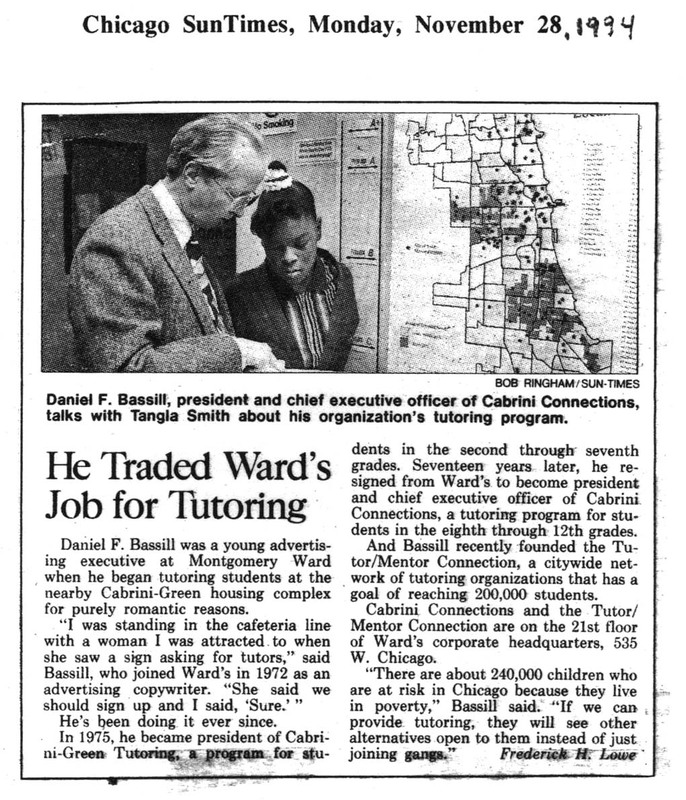 This 1994 Chicago SunTimes illustrates how I was trying to use GIS maps to fill high poverty inner city neighborhoods with mentor-rich, non-school tutoring, mentoring and learning programs. 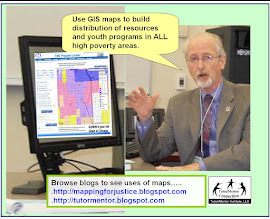 I was introduced to GIS mapping in early 1993 by a volunteer from IBM who was working on a project with the city of Chicago. I attended presentations where the maps were projected on a large screen, and were interactive, meaning the people leading the conversation could build greater understanding of what the map was showing than you could get just looking at a map in a book. In the last decade there have been a few TV police shows using maps this way. Last night I toured the Electronic Data Visualization lab at UIC. We met in a classroom where one entire wall was made up of computer screen panels. You could project a single image to fill the entire wall, or you could have mutiple screens open at the same time. Then I experienced the 3-D CAVE where you could walk "inside" a map or a diagram, along with many others, to get a better understanding of what was being discussed. I've never had the money to apply any of this to my own efforts. So when I see stuff like this, I feel like a "kid in a candy store". I drool with envy. Well, I just had another similar experience. The image below is from an ESRI story map, showing food insecurity (hunger) in the Washington, DC area. I hope you'll open the map and read through the analysis. As you do, imagine the thinking and collaboration implied in this process. Here's one PDF showing how I have been trying to use maps. Here's another. Read articles on this blog, and the Tutor/Mentor Blog and you'll see many more. Then imagine being able to put this into story maps like the DC folks have done, and to be able to bring people into a technology center like at Microsoft or UIC and lead a conversation, using the maps, focused on generating the public will and resource flow needed to support the growth and on-going operations of mentor-rich non-school, youth-serving programs which are expanding the network of adults helping kids go from first grade through high school and into adult lives with a job and a career free of poverty. In the image I'm showing above, the red and yellow dots are partners who help distribute food to those who need it in the DC area. What I don't see on the story map is a discussion of funding. 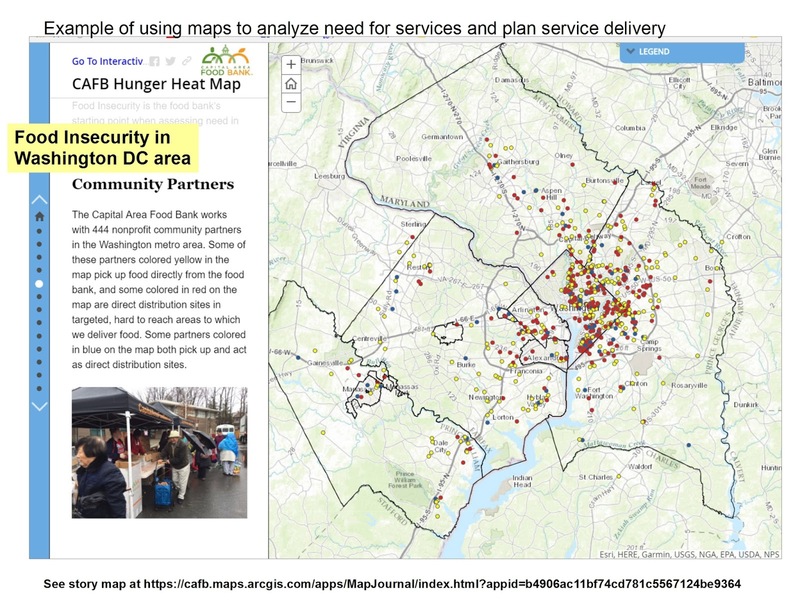 Not the funding of the Capital Area Food Bank, and this mapping project, but the funding of all of the organizations who need to be involved in this food distribution network. How are all of these organizations supported? Do they each have the money, talent, technology and resources needed to do this work as well as it needs to be done. Are there other potential food distribution and education partners, such as non-school programs, which could be another layer of information. Who are the businesses, faith groups, colleges and hospitals who could be involved, or who are already involved? Those are additional layers of information, conversation and analysis that could go into what is already a fantastic use of GIS technology and data visualization. 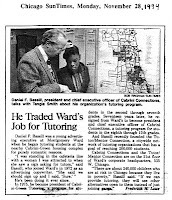 In the 1990s I met with folks at the Chicago Food Depository and we talked of their use of maps and my goal for using maps, however, this never led to any of the types of collaboration that might have happened if I had been able to bring more resources, or civic leadership, to the table with me. It's not too late. 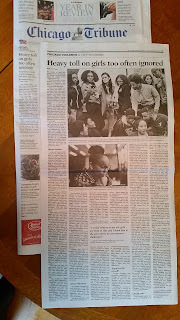 The newspapers keep reminding us that we need better strategies to reach youth with alternatives to gangs and violence. If you can imagine this, can you help me build a team of people, and find the money, to build such a capacity and use it in Chicago and other cities? Last year I wrote this article to show why I attend weekly Chicago Hack Night meetings, which are "Chicago's weekly event to build, share &learn about civic tech". In a couple of weeks #chihacknight is celebrating five years of weekly meetings and participants have been encouraged to write about why they participate. I shared reasons for why I participate in last year's article. These have not changed. I attend for the weekly presentations, which expose me to new ideas, and to build relationships with people working in this arena. However, most of my networking and learning is done in the Slack channel where members interact daily. I've been able to reach out to forge stronger relationships around area's I'm deeply interested in, such as mapping and public engagement. However, what's really valuable to me is the daily sharing of articles that I would not be aware of if I were not visiting Slack and following the conversation thread. 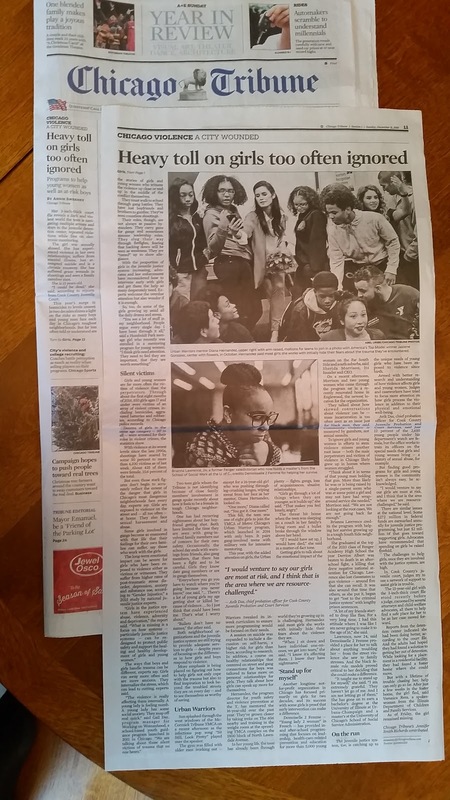 For instance, today, I saw a mention of an article titled "What 100K can do for civic journalism in Chicago." I read the article, then reached out through the City Bureau web site and Twitter feed to introduce the "Rest of the Story" media strategy that I've used since 1993 to draw more frequent attention to neighborhoods where media stories cover bad news, but don't draw resources to help change that to good news. I shared this 2014 blog article following a shooting in Rodgers Park, which encourages students from local high schools to tell the story via their own writing, videos and social media. Another example. During the weekly meetings I learned about how one group wanted to create a web portal to help volunteers find places to do service in Chicago. On the Slack channel I learned more about this, and visited the GitHub page to offer my own ideas on this project. A third example. Another link posted on the Slack channel today was one that pointed to this web site, encouraging Chance the Rapper to run for Mayor of Chicago, and encouraging non-voters to get involved. I visited the site and was really impressed with the creative way it presented this information. So, I looked them up on Twitter and said "great job". I also shared a set of articles I've written with Chicago's Mayor as the focus, and said "You, and people like you, could do these 10,000 times better than I do." Below is a response to my Tweet. Often I add links to some of the articles and web sites I find through the Slack conversation to the Tutor/Mentor Connection web library, making the ideas available to myself in the future, while making them also available to anyone else who ever visits my library. I've been using maps since 1993 to draw volunteers, donors, talent and ideas to youth serving organizations in high poverty neighborhoods so that there would be a wide range of mentor-rich programs working to help young people grow up safely and enter their adult lives with a network of people helping them....just like what's available to kids in more affluent areas of Chicago and other cities. The mapping I do has been largely supported by volunteers, so there are many who attend ChiHackNight who could help me do this, and do this better. Many of the visualizations I show were created by interns, borrowing from ideas I launched in blog articles like this. There are many who could do this better than I do, such as the creators of the Chance4Mayor site. The stories I write here and on the Tutor/Mentor Institute, LLC blog. need to be written by many people, using their own talent, technology and resources, and communicated daily, reaching people in all parts of the Chicago region, motivating on-going, long-term, actions that result in more help for those living in poverty and distressed situations. For forty years I've learned from the ideas and work being done by others and I've applied this learning to my own efforts. I'm really happy to have ChiHackNight as part of my network and appreciate the dedication and commitment of the organizers who have made these weekly meetings happen for the past five years.